Finished size 50" x 68". 20 Squares for the afghan, 4 optional 12" x 12" pillow squares. Universal Yarns Classic Shades Book 3: Color Your World Collection Patterns - 24 Windows Throw - PDF DOWNLOAD is a similar pattern: 17 (4.25 sts. / inch) finished gauge, blankets and afghans garment, and for home. You may also like Malabrigo Book 08: In Central Park Patterns - Springbanks - PDF DOWNLOAD, which is another similar pattern: blankets and afghans garment and for home. 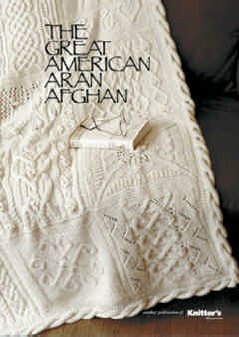 You may enjoy taking a look at the Cascade 220 Great American Aran Afghan Blanket, and XRX Great American Aran Afghan kits all using Knitter's Magazine Great American Afghan Patterns. Hopefully our suggested yarn options for Great North American Afghan can help you come up with your next exciting new project idea!